"Welcome to Aw Yeah Comics! We are open and ready for business!" Every hero has their villain. Their arch-nemesis who seems to be a constant pain in their side. It's not often though that the villain brandishes a device that turns people into lizards as is the case in Aw Yeah Comics: Action Cat & Adventure Bug! #1 from Dark Horse Comics. The issue is written by Art Baltazar and Franco and illustrated by Baltazar. Fresh from the creative minds at Aw Yeah Comics—a brand-new series starring the valiant Action Cat and his trusty sidekick, Adventure Bug! As Evil Cat lurks behind the scenes, our heroes endeavor to bring comics to the good people of Beautiful Downtown Skokie. You better believe hijinks will ensue! 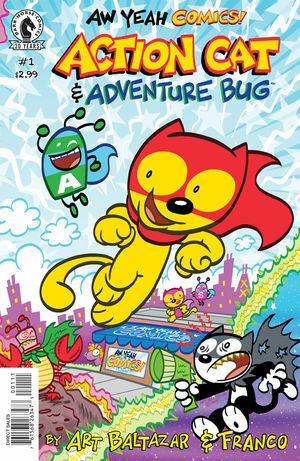 Aw Yeah Comics: Action Cat & Adventure Bug! #1 is actually a series of short stories that all revolve around a confrontation between Action Cat and Evil Cat. Despite the multiple stories, Baltazar and Franco offer a script that feels tight and brings everything together very cleanly. En route to that sense of conciseness the duo work in quite a few sight gags and outlandish scenarios to remind the reader that this book is meant to be enjoyed. Some of the dialogue choices by Baltazar and Franco are lighthearted and don't require a lot of thought on the part of the reader to digest. The relatively easygoing flow of the book makes it fly by extremely quickly and rather enjoyably. Baltazar's artwork in Aw Yeah Comics: Action Cat & Adventure Bug! #1 is cartoonish. The art style fits the tone of the book perfectly though, offering up plenty of zany scenarios that emphasize an Animaniacs mentality when it comes to the characters interacting with one another. The panels offer a newspaper strip feel to the book as well that furthers the reader's enjoyment of the shenanigans as they unfold. And the color choice by Baltazar is extremely breezy, reinforcing the notion that Aw Yeah Comics: Action Cat & Adventure Bug! #1 is meant to be savored and not over-analyzed. Aw Yeah Comics: Action Cat & Adventure Bug! #1 doesn't shy away from being what it wants to be, which is a comedic book about outlandish scenarios featuring anthropomorphized characters. 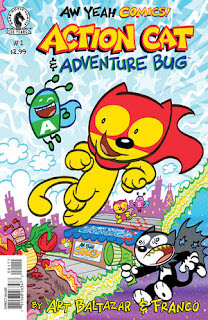 Action Cat and Adventure Bug clearly live up to their titles and the reader is all the better for that. The script by Baltazar and Franco is easygoing and paced cleanly. Baltazar's artwork is just as feathery as the tone of the book itself. Aw Yeah Comics: Action Cat & Adventure Bug! #1 is a pretty whimsical issue that doesn't take itself too seriously. Aw Yeah Comics: Action Cat & Adventure Bug! #1 is in stores now.